This evening I, along with about 1000 others, protested in Oakland against the failure to indict Darren Wilson, Ferguson cop, for the homicide killing of unarmed Michael Brown. “Black lives matter, Brown lives matter”, said the signs. After about 2 hours of marching, I began to think that the only thing that mattered were my sore feet and my aching back. But I kept at it. At some point along the way I noticed that a few trash can fires had been set by one of the protesters. That took me back to the People’s Park demonstrations in 1969 when I was working at Campus Smoke Shop/Campus Records on the southwest corner of Bancroft Way and Telegraph Avenue, right across the street from the UC Berkeley Student Union. The owner of Campus Records/Smoke Shop told me to retrieve the stacks of newspapers that were on the racks outside in front of the store. At this time, protesters were setting trash can fires outside using any ready-at-hand flammable materials. So I grabbed a huge stack of the boss’s newspapers off the racks, brought them inside, and went back to get another stack. But as soon as I picked them up, I could see out of the corner of my eye an Alameda County Sheriff’s Deputy (a.k.a. “Blue Meanie”) wielding a baton and running in my direction. With no time to write a term paper on the best action to take under the circumstances, I threw the whole big stack of newpapers in the face of the Blue Meanie, ran inside the store, and slammed the thick door on him. Whatever else one can say about Darren Wilson, one can certainly maintain he is in the class of the too many police officers who swing or shoot first, and never get around to asking questions about their own actions. Racial profiling was certainly operative in the mind of Darren Wilson. Perhaps in the case of the Blue Meanie, the fact that I resembled somewhat a Berkeley hippie and that he tried to attack me without cause, might reasonably be considered evidence of “hippie profiling” on his part. Along the protest route tonight, when I was getting quite tired, and was slowing down, someone came up to me from behind, said “Move out of the way”, quickly followed by “Excuse me”, instantly followed by poking me in the back. It hurt. The lady who poked me and her two female companions were holding a yellow banner. I was curious about what it said, so I soon overtook them. The banner said “Standing on the side of Love”. It turns out that I got whacked by the Unitarian-Universalist contingent from Oakland. I had been standing on the wrong side of love. And I wasn’t even carrying any newspapers. If you take a look at the photograph below, you can see a few of the 2,200 National Guard troops sent in to Berkeley to quell the People’s Park Brouhaha by 20 Mule Team Governor Ronald Reagan, whose signature, incidentally, I have on my diploma from UC Berkeley. 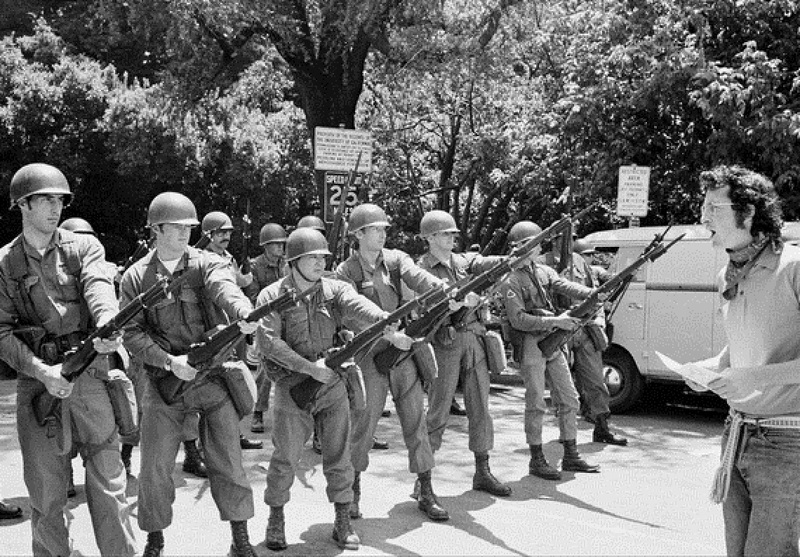 One day in May 1969, a very long single line of these National Guard troops were lined up along Bancroft Way on the Student Union side. Each of the Guardsmen was in exactly the stance shown below, with bayonets fixed on their rifles, rifles at a 30 degree angle from horizontal. As I was watching this scene through the window at Campus Records, a young woman student walked across the street towards one the Guardsmen, walked right up to him, and placed the stem of a flower down the barrel of his rifle. Now THAT’S standing on the side of love. When I post to this forum, I must include a musical anecdote, so I will choose another incident from 1969 (or perhaps 1970). Mario Savio, between the time he was the most prominent leader of the Free Speech Movement and the time he became a lecturer on mathematics and philosophy at Sonoma State, worked for Fred Cody at Cody’s Books at Telegraph and Haste. One day Mario strides into Campus Records, hears me playing my own personal copy of the LP recording on RCA Victor of Vladimir Horowitz playing Mussorgsky’s Pictures at an Exhibition at Carnegie Hall in 1951. “How much does it cost?”, Mario asks. I tell him “It’s not for sale.” He wants to buy my copy anyway. I tell Mario that this LP has been out of print for a while, and we don’t have any copies. I tell Mario that sometimes I bring some of my own recordings from my apartment to listen to while I’m working, just to avoid the boredom. “But how much does it cost?”, Mario asks. “It’s not for sale, Mr. Savio. Listen, Mario, I’m not a captain of industry, I’m not even a corporal of industry, not even a buck-private of industry. I’m just an ex-student of music at UC who is hanging out here while trying to figure out what the hell I’m going to do with the rest of my life after I quit working here. But if you insist that I’m a capitalist, I can tell you that we have some overstock of a fine recording of Gary Graffman playing Pictures at an Exhibition, and I will sell you a copy for 99 cents.” At this, both Mario and I started laughing, and he walked out of the store. I should have offered to lend him my recording of Horowitz. I am but mad nor-nor-west. When I worked at Campus Records, I learned to tell a hawk from a hand grenade.